Here’s a short clip with a “classical” EQ capture with the Cycfi Neo6 polyphonic pickup mounted on a Fender Stratocaster bridge position. The strings are panned from right to left, with the low-E at the right and the high-E at the left. Scroll below for details. That’s cool. But does it rock? Here’s a short composition: Thousand Paths Lead Back to You (Joel de Guzman 2014). This one is mixed to mono using the EMG-81 EQ capture (again scroll below for details) before applying distortion and amp simulation. From acoustic to heavy-metal in a single shot! Here’s a simple E chord recorded with no effects and no EQ. Here’s Recuerdos de la Alhambra —a classical guitar piece composed in 1896 in Granada by Spanish composer and guitarist Francisco Tárrega. The Neo Series active polyphonic pickups have a uniform frequency response from 20Hz to 20Khz. The sound is very clean with lots of overtones and crystal clear highs. The low impedance coils (at 350Ω per coil) give the pickups its characteristic wide bandwidth. A standard Fender Stratocaster pickup, in comparison, rolls off at around 5Khz. 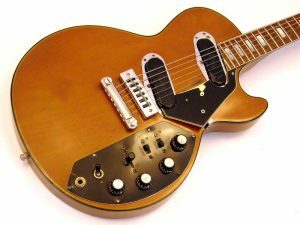 The use of low impedance pickups is not a new idea. An important example is Les Paul’s favorite guitar and the one he used since the early 1970s: the Les Paul Recording Model. For Les Paul, it’s the the ultimate recording guitar. It was designed to be plugged directly into a mixing console. Now that’s a cool idea. The only problem was that only a select few at the time could afford owning a mixing desk! The output of the low impedance pickups could not sufficiently drive guitar amplifiers like the Marshall. Driving amplifiers into saturation was what people wanted! It did not catch on. Perhaps because it was ahead of its time. The Neo polyphonic pickup, like the Les Paul Recording Model recording model, is also designed to plug directly into a mixing console. The big difference is that computer audio interfaces are now quite affordable and software effects processing has now become rather commonplace. First, we have a raw sound clip of the Neo6 polyphonic pickup mounted on a Fender Stratocaster bridge position compared to an EMG-81 pickup bridge position and a Gibson Les Paul Studio bridge pickup. There are no effects and no EQ. The EMG and Les Paul are recorded straight into a high-impedance DI input of the audio interface. The pickups are meant to be equalised to suit one’s taste.You use your DAW (Digital Audio Workstation) to sculpt the tone. A full bandwidth response will give you full freedom to shape the frequency response —it’s the perfect blank canvas. There are many ways to sculpt the tone. One way is to start with a guitar recording you like and capture its EQ using an EQ matching plugin such as Voxengo CurveEQ or Logic Pro’s Match EQ. You teach the EQ matching plugin your desired frequency response by feeding it the prerecorded sound clips. 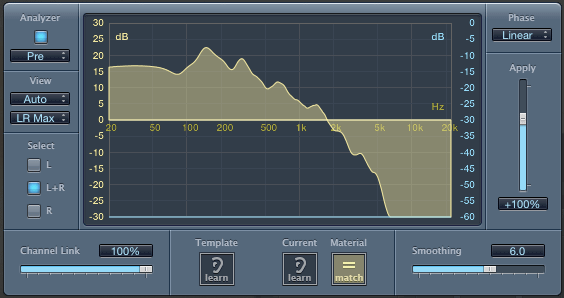 It then listens to your raw sound and calculates the necessary EQ adjustments to match the target EQ. For the sound snippets below, I used Logic Pro’s Match EQ. Note: EQ capture is an interesting technique but keep in mind that the result is not an accurate replica of the target. It is however quite useful to easily get something up fast without ever having to fiddle with knobs and sliders which can very easily sink a lot of your time in the studio. It is possible to get more accurate results with a DSP convolution and deconvolution. There are tools such as Voxengo Deconvolver that can capture the sound spectra of any medium by extracting its actual impulse response. For example, it can accurately capture anything from speaker cabinet response to full cathedral reverberations. The result is amazingly convincing that the technique has become standard now in the implementation of reverb effects as well as emulation of various microphones, vintage EQs, speaker cabinets, etc. Essentially, anything that can be modeled as a filter can be captured. And surely, the guitar pickup is just another filter! What’s interesting is that with polyphonic pickups, the target response can be captured down to individual strings. The major drawback is that convolution is computationally expensive. But hey, we are now in an age where you see multi-core processors inside your humble mobile phone. We’ll get into (polyphonic!) convolution and deconvolution later. Here are a couple of sound clips using various EQ captures with the Neo6 polyphonic pickup mounted on a Fender Stratocaster bridge position. The strings are panned from right to left, with the low-E at the right and the high-E at the left. Minimal effects: a bit of compression and a touch of reverb. Hey, this is a polyphonic recording mixed to stereo. Best get your best headset ready or run the sound clips through your awesome cool stereo system. 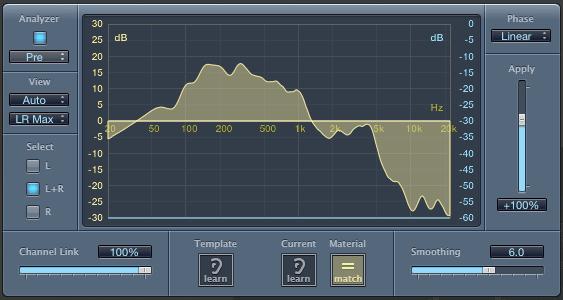 Here’s how it sounds when a classical guitar is captured as the target EQ. How about the EQ matching a Les Paul neck pickup? I like the second mix for this piece. It does not sound exactly like a classical guitar, of course, but it fits the music quite nicely. I used that tone for the classical sound clips at the top. For the heavy-distortion clip, however, the EMG or the LP EQ captures are better. Distortion and overdrive are never friends with bright sounding guitars and it’s always better to roll off the highs before anything else. Congratulation!! i´ll wait for the DSP convolution and deconvolution article!!! It has a very acoustic-like raw tone. It is rich in harmonics and overtones. I asked my nephew to sit down in front of the speakers and guess what was playing in the video (not shown to him). His guess was a classical guitar! Raw is acoustic-like. I do not have a classical guitar and is just comparing with the tone I remember hearing from the classical guitars of my collector friend. The upper strings are convincing, almost piano like (something you hear on aged wood). The lower strings (higher frequencies) are acoustic-like but may need a little tweaking. I cannot describe it, but the tone is a cross between steel and a nylon string. Since emulation is via software, I do not see this as a problem. On the electric guitar emulations, I suggest reducing the harmonics so it will not sound like an acoustic. I am not familiar with EMG but the les paul bridge emulation needs a little more bite, a little more lo-fi. It is simpler to remove frequencies than add them right? My initial observation is that the Neo has more information than the current-available pickups and is too clean; hence, emulating them should include taming them. That is if you want to emulate electric guitar pickups. If your objective is to make it sound better than the original les paul pickup sound, then it is no contest. The Neo is better since you can shape to the tone you want! The Neo sounds analog to my ears, even with the digital processing. The best part is that the individual strings are distinct, even at distortion levels! I suggest you market the Neo not as a pickup that can emulate other pickups, but as a versatile pickup whose tone can be customized to your liking. The ability to emulate at a flick of a switch is a bonus. Just create a site where users can upload their settings and let them create the settings that emulates popular pickups. You cannot capture the tone from the best guitars in the world, but users who have these guitars can. The strings in the video are not balanced vs the ones in the sound clips, at least to my ears. The bass strings seem to be louder than the treble strings. The overall tone is great though. The guitar player is good. The polyphonic pickup makes it appear like there is more than one guitarist playing, like a relay race where each musician is assigned a set of strings to pluck. You have opened a new world of possibilities in recording! I suggest building an interface box for the Neo. This pedal will accept the polyphonic input, provide simple tone shaping (equalizer? ), and output to mono for connecting to regular amps. A more advanced version should be programmable (thru PC) with foot switches for selecting the desired tone. – To be more accurate, it is easy to cut frequencies than to boost frequencies. We are not really adding frequencies. We can only boost what is in there to begin with. The problem with boosting signals is that you also boost the noise. – “emulating them should include taming them”. Exactly. That is the very idea I presented in this page. It’s all about sculpting the tone. To me, it’s not really about having a better sound than a LP or a Strat. I’m more excited about exploring new sounds. The purpose of this exercise in capturing EQs is to present an easy way to start with something familiar and then explore the sounds (and frequencies) that were previously missing. – “I suggest you market the Neo not as a pickup that can emulate other pickups, but as a versatile pickup whose tone can be customized to your liking.” Exactly! That’s the very idea that I am trying to advocate. – About the video: nods. That’s what the session guitarist said as well. The nice thing about polyphonic recordings is that you can mix the balance any way you want. One more note. That session took two takes. If I had more time, I’d typically refine the takes like crazy, but the downside is that you lose the fluidity and artistic flow. At one point there was actually an audible ‘clack’ in the performance when the guitar player hit the pickups with his nails (this is his first time to use an electric for a classical piece!). Now, since the recording is polyphonic (6 tracks), it was easy to spot and get rid of the glitch without having to re-take. That would have been impossible to edit with a mono recording. – Interface box: Again, exactly my idea. One step at a time 🙂 I’ll share my roadmap in another post. almost all of the very good solid bodied electric guitars i have tried (a lot of them are old ones) had an acoustic sound that is so similar to the best of the steel stringed acoustic guitars. the best ones are 3D sounding when heard unplugged. unless one wants to find new ‘sounds’, i opine the clips above, being ‘acoustic guitar’ sounding, is already good — no need to change unless you’re after something new. Brilliant Joel! a dream come true, kudos! Love also the distortion effect. Just heard the distorted example – very nice! To me you’re really making the point very strongly that a flat response pickup offers a very powerful source for EQ shaping. The raw clean sound is brighter than I would want for my distorted sounds but that’s not a problem as soon as you apply the EQ shape you like. Yes. And if there’s anything I learned about (digital) signal processing. Everything is a filter. Distortion and overdrive are never friends with bright sounding guitars and it’s always better to roll off the highs before anything else. I love the classical guitar examples, they really take advantage of the polyphonic signals. 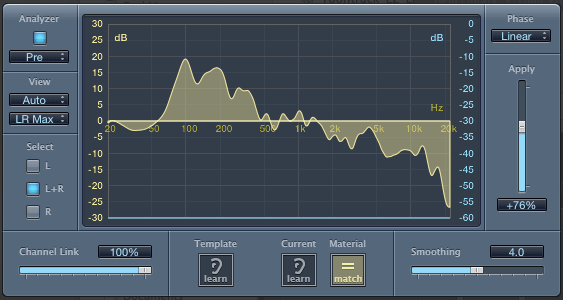 I agree with you that the classical guitar EQ matching is my favorite of the ones presented. Very full sounding for solo repertoire. The last clip with the Les Paul neck pickup still sounds like a bridge pickup to me, but it really makes me curious to hear your Neo-6 mounted in the neck position. Great sounds and beautifully made pickups! Thank you, Leo. EQ capture can never hide the character of the bridge pickup. In addition to the frequency response of the pickup, the nodes and standing waves at the poles position also contribute to the pickup’s signature. That signature is a comb-filter with intervals related to the position of the pole. It’s only possible to hide that signature by applying a reverse comb filter. Then by applying another comb filter which is the signature of the neck pickup (for example), we can truly simulate another pickup position. That would involve elaborate individual DSP processing, but I intend to move in that direction.